If you missed the first installment of the PNP Diaspora Dialogue here is your chance to get in on the fun & enlightening dialogue on topics affecting the African Diaspora! 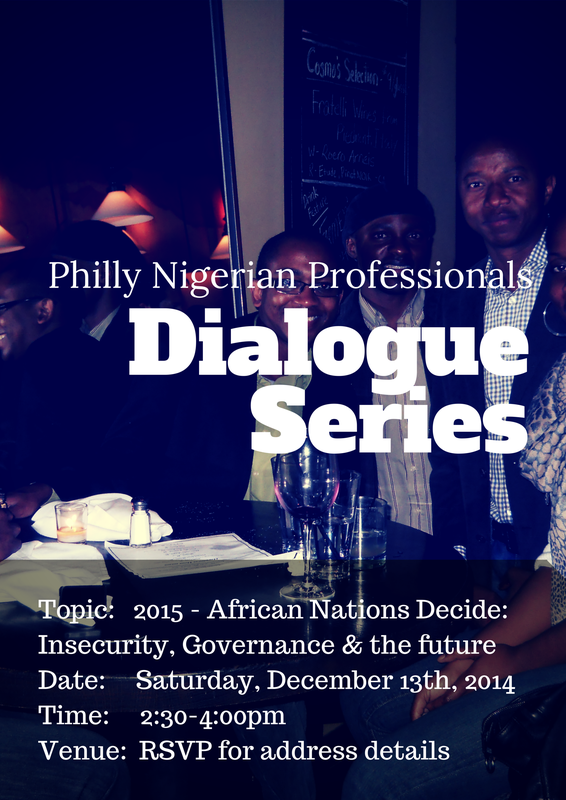 This session’s topic is: African Nations Decide 2015: Insecurity, governance & the future. In just a few short months, Nigerians will go to the polls in early 2015 to decide who their next president will be. In Burkina Faso, citizens await elections after protests led to the ouster of long time ruler Blaise Compaore. But with so many challenges facing both of these nations, including insecurity, a struggling currency, and wide economic disparities between the haves and have nots, this election could potentially make or break both countries. Join us as we discuss the issues facing the candidates, who the candidates are, and what’s at stake for the future of Nigeria and Burkina Faso. Will people in the diaspora have any impact on the elections? If so how? And should Nigerians and Burkinabes abroad be allowed to vote in national elections? We want to hear your thoughts. so join us! Please RSVP at phillynaijaprofessionals@gmail.com for full venue details! Light refreshments will be served.